Aurora is a new Jacksonville Florida based startup that is looking to connect two mobile experiences in one cool functioning app. By using the Aurora app, people will be able to rediscover a city through that cities local artists. This app combines location discovery with artist discovery in a way that actually makes sense. Creator Angel Ayala Torres took to the Hemming Plaza Pitch Deck stage on Wednesday afternoon to pitch Aurora to an enthusiastic audience. I actually heard the pitch about an hour earlier in the day at the OneSpark food village when I bumped into Torres and at that time I didn’t totally understand the concept. Now, after watching him pitch and downloading the app, it makes a lot of sense. It’s perfect for local people and local artists. As he says in the video, take downtown Jacksonville for instance. When you open up Aurora downtown it will immediately start streaming a local downtown Jacksonville artist. If you hear a slow song and you’re briskly walking or jogging and “shake” your iPhone it will change the song and match it to your “mood” they call this “mood swings”. Now if you venture to the beach area of Jacksonville or even New York City, you’ll get artists that are local to those areas. The Aurora team calls those “Echoes”. In New York you’ll hear New York echoes and in Jacksonville you’ll hear Jacksonville artists. Aurora is working on a market place where users can purchase the songs to keep on their phone. This way you could listen to the artists wherever you go. Local Jacksonville artists are jumping at the chance to have their music in the Aurora platform. Really this is a great idea for local music discovery. Just think of the music you would get in a city like Memphis, Nashville, New Orleans or Seattle. Every city has it’s own unique music scene and through Aurora you can easily discover it. Find out more about Aurora here at their Facebook page. 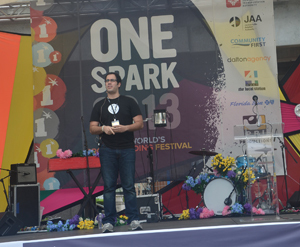 We’ve got more OneSpark coverage here.